Over 20 families were displaced and left without a roof over their heads. 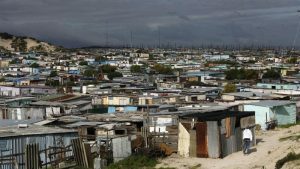 This after the Johannesburg Metro police demolished the shacks of residents living in Mayibuye informal settlement, near Midrand, on Wednesday. Metro police say they were forced to remove these shack dwellers as they were illegally occupying the land. Nonjabulo Ndlovu is among those who lost their shacks, she used to share the small dwelling with her three children. “I got call phone informing me that my shack was being erected. We thought this was our home. Now I am left with nothing, I am unemployed, I don’t have money and I don’t know what the kids will eat after school,” says Ndlovu. Residents were left stranded after their shacks were demolished. “They should have given us our material but they took everything, we’re left with nothing,” argues another resident. They claim that Metro police did not give them any warning. “I tried to talk to and stop them but they refused. I said where is the letter for you so that you can take our shacks. He said to me we don’t care about the letter we here to take the shack. We don’t care about the letter, that is what happened to us,” says Community Leader, Casman Matloga. Residents say this has left them stranded with nowhere to go and with little hope of finding a resolution to their troubles. The post Police demolish shacks at Mayibuye informal settlement appeared first on SABC News – Breaking news, special reports, world, business, sport coverage of all South African current events. Africa's news leader..
NEXT POST Next post: Red Devils or Reds for the Big 1?